Queen Elizabeth II leaving the Deanery with her family, Maundy Thursday 1959. © Keystone View Co.
On 29 March 2018, St George’s Chapel, Windsor Castle, will host the Office of the Royal Maundy, at which Her Majesty The Queen will distribute purses of Maundy money to nominated recipients. This will be the third Royal Maundy held at Windsor in the present reign, the second being two years ago, in 2016, and the first being in 1959 when this photograph was taken outside the Deanery. 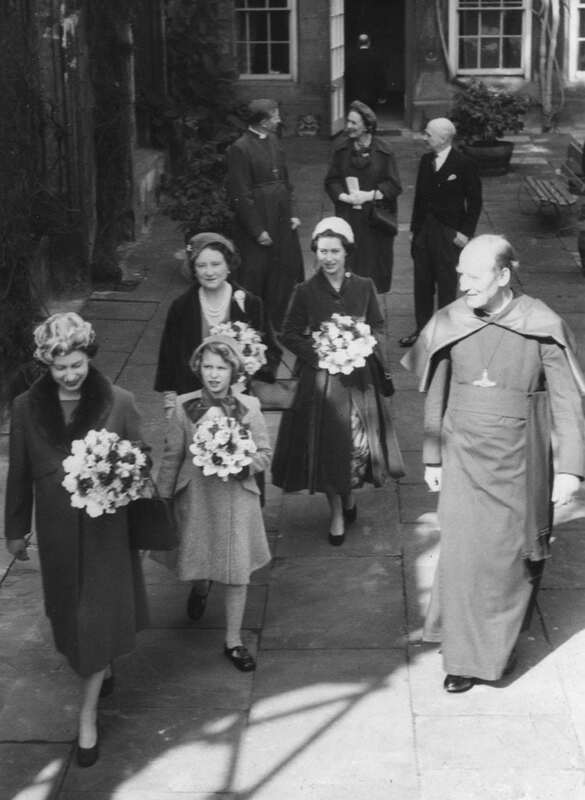 In the foreground, The Queen, accompanied by her daughter, Princess Anne, her sister, Princess Margaret, and her mother, is escorted across the Deanery garden by Dean Eric Hamilton. Members of the Royal Family carry Maundy nosegays (small bouquets of scented flowers). Members of the Royal Almonry, the Royal Household office which is responsible for arranging the event, may be seen in the background. The distribution of alms by Kings and Queens of England on Maundy Thursday (the Thursday before Easter) is an ancient ceremony dating from at least the thirteenth century, the first recorded royal distribution being made by King John in 1210. The term Maundy is believed to derive from the Latin word mandatum, meaning a commandment, and is thought to refer to the instruction which Jesus gave to his disciples at the Last Supper, the day before He was crucified, that they should love one another as He loved them. It was in this spirit of charity that medieval monarchs gave money and clothing to the poor on Maundy Thursday, also stooping to wash their feet in imitation of Jesus washing the feet of His Disciples as a sign of His humility. Although the act of washing feet was discontinued from about 1730, the Lord High Almoner and his assistants, who accompany H.M. The Queen, still carry linen towels on their belts in remembrance of the foot-washing ceremony and nosegays to protect them against unpleasant odours. Each recipient receives two purses from the Monarch: a red purse containing a nominal allowance (in regular coinage) towards the purchase of clothes and provisions, and a white purse containing Maundy coins. These specially minted silver pennies, tuppences, threepences and fourpences add up to the age of the Sovereign at the time they are distributed. The number of recipients also reflects The Queen’s age. This year 92 men and 92 women will receive Maundy purses, having been selected from dioceses across the country in acknowledgement of their Christian service to the Church and their local communities. In the Middle Ages, when the Court travelled regularly round the country between royal palaces, the annual Royal Maundy was observed wherever the Sovereign was in residence at Easter. Although Maundy expenditure was customarily recorded in the official Wardrobe accounts, the records seldom state where the ceremonies took place. However, we know from these Wardrobe accounts that the Royal Maundy was held at Windsor on at least two occasions in the medieval period. In 1378, King Richard II’s Almoner was ordered to provide three ells of red cloth and a pair of shoes for each of the eighty-four poor persons at Windsor ‘in die Cene’ (the day of the [Last] Supper). In 1423, with Henry VI presiding at the tender age of two, the Almoner was required to furnish shoes and gowns of russet cloth with hoods for two poor persons ‘at the mandatum of the King himself made and held at Windsor’, together with an apron and towels of Flanders linen ‘to wipe the feet of the said poor’. From about 1730 the Royal Maundy ceremony settled in one place – firstly at the Chapel Royal at Whitehall (c.1730-1890) and then at Westminster Abbey (1890-1952). Since Queen Elizabeth II ascended to the throne, the honour of hosting the occasion has been shared between Westminster Abbey and forty-seven other religious institutions including forty-three different Anglican cathedrals. We are delighted that it has returned to St George’s Chapel in 2018.